Habit: Annual [perennial herb], generally taprooted. Stem: generally erect, simple or branched. Leaf: mostly cauline at flower, alternate, sessile (in California), generally 1-veined, linear or elliptic to (ob)ovate or spoon-shaped, entire, toothed, or 1--2-pinnately lobed, minutely coarse-hairy to long-soft-hairy, generally glandular. Inflorescence: heads obscurely radiate or disciform, in +- flat-topped or raceme- or panicle-like clusters; involucres +- obconic, 2--7+ mm diam; phyllaries 20--40+ in 2--4 series, appressed, generally reflexed in fruit, linear to lanceolate, +- (un)equal, margins +- membranous, abaxial face +- green, minutely hairy, generally glandular, midvein not orange to brown; receptacle +- flat, pitted or smooth, epaleate. 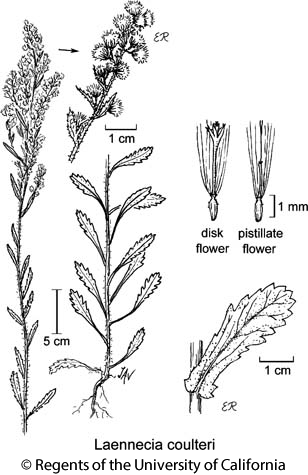 Pistillate Flower: 60--100; corolla thread-like, +- yellow, generally distally truncate or 2--5-toothed, ray 0 [0.5--1+ mm]. Disk Flower: 5--20[30+]; corolla +- yellow, narrowly funnel-shaped, throat > tube, abruptly expanded distally, lobes deltate; anther tip awl-like; style-branch tips +- deltate, papillate. ; anther bases minutely cordate. Fruit: oblong to elliptic or obovate, compressed, each edge 1-veined, faces glabrous or +- minutely strigose, often stalked- or sessile-glandular; pappus in California of 9--30+ white to tawny, minutely-barbed, distally long-tapered bristles, in 1 series, +- equal, persistent. Habit: Annual 1--15 dm. Stem: 1--several from base, generally simple proximally, much-branched distally. Leaf: proximal 2--7(10) cm, 1--2.5 cm wide, widely spoon-shaped to oblong, obscurely lobed or coarsely toothed; distal 1--3 cm, 3--10 mm wide, coarsely toothed or entire. Inflorescence: heads in raceme- or panicle-like clusters; involucre 2.5--3+ mm; receptacle 2--3 mm diam. Pistillate Flower: 60--100+; corolla 1.5--2 mm, +- 1/2 style, ray 0. Disk Flower: 5--20; corolla 3--4 mm. Fruit: 0.5--1 mm, pale tan; pappus (2.5)3.5--4 mm, +- white. Chromosomes: 2n=18. Citation for this treatment: Bruce G. Baldwin, adapted from Strother (2006) 2012, Laennecia coulteri, in Jepson Flora Project (eds.) Jepson eFlora, http://ucjeps.berkeley.edu/eflora/eflora_display.php?tid=3698, accessed on April 20, 2019.
s SNF, SnJV, CW, SW, SNE (exc W&I), D; Markers link to CCH specimen records. Yellow markers indicate records that may provide evidence for eFlora range revision or may have georeferencing or identification issues. Purple markers indicate specimens collected from a garden, greenhouse, or other non-wild location.